Credit Unions Kids at Heart® (CU Kids at Heart) is a Massachusetts-based 501(c)(3) charitable organization, and one of the largest credit union collaborative fundraising programs in the nation. Eastern Corporate Federal Credit Union (EasCorp) of Burlington, Massachusetts, founded CU Kids at Heart in 1996 with a small group of Massachusetts credit unions. The Team aimed to leverage the collective impact of credit union charitable efforts and to reflect of the industry's belief in collaboration in service of a greater good. Since that time, the program has expanded to include dozens of participating credit unions and corporate sponsors nationwide. CU Kids at Heart is dedicated to helping children lead healthy and happy lives.The Team and its supporters are committed to funding research activities aimed at the prevention, treatment, and/or cure of pediatric neurological diseases. For the past several years, the Team has worked closely with the medical investigators at Boston Children's Hospital, Dana Farber Cancer Institute, and their research affiliates to fund research activities aimed at the prevention, treatment, and/or cure of pediatric neurological diseases, including Sturge-Weber Syndrome, Moyamoya disease, Cerebral Palsy, epilepsy, and pediatric brain cancer. As of May 2018, CU Kids at Heart has raised over $6 million toward this fundraising directive. CU Kids at Heart Team Raises More than Half a Million Dollars! 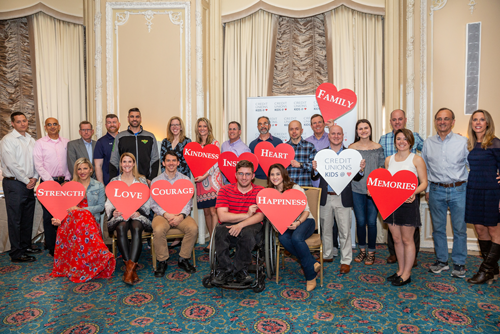 The CU Kids at Heart Team has exceeded its 2019 fundraising goal, raising more than half a million dollars toward research initiatives at Boston Children’s Hospital. Donations are still coming in and will be updated on the Donate page. Thank you to all who supported this Team and its mission to help children lead happy and healthy lives. You have made a difference. To read the full press release, click here. Tracking our Marathon Runners? There's an App for That! Today twenty-two runners on the CU Kids at Heart Team will run the Boston Marathon to raise money for research initiatives at Boston Children's Hospital. The Boston Athletic Association, organizers of the Boston Marathon, offer an app to track a runner's progress along the 26.2 mile route with updates at set markers (5k, half marathon, etc.). Available for download on the App store for iOS devices and on Google Play for Android devices, the B.A.A. Marathon app allows you to enter one or more bib numbers (the runners' identifying numbers). Click here for a list of our runners' bib numbers, alphabetical by last name. The Team will begin running around 11 am as part of Wave 4. CU Kids at Heart has partnered with the Team Jack Foundation, a non-profit foundation chaired by New England Patriots running back Rex Burkhead, in the fight against pediatric brain cancer. The Team will donate to the Team Jack Foundation in support of new and ongoing research initiatives and promising clinical trials at Boston Children's Hospital, Dana Farber Cancer Institute, and Beth Israel Deaconess Medical Center. Learn more on our Affiliates page. "David, the Magician, loves to perform magic but his favorite trick is not pulling a rabbit out of a hat or finding quarters behind the ears of children. Instead, David knows the magical power of books, which can explore dreams and develop creativity".